This past week has been so lovely with longer sunny days and suddenly winter is over. At last. 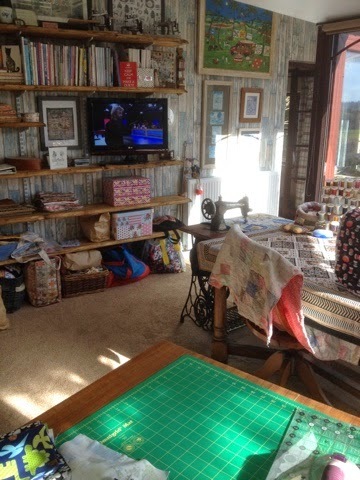 I've been trying to put my sewing studio back in order - not easy! But the makeover is worth all the effort as you can see. 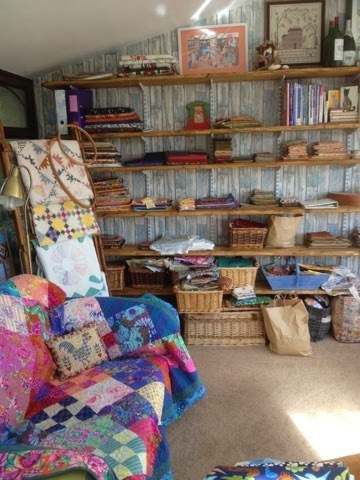 Still lots of fabric sorting to be done but slowly it's coming together. I am so thrilled. 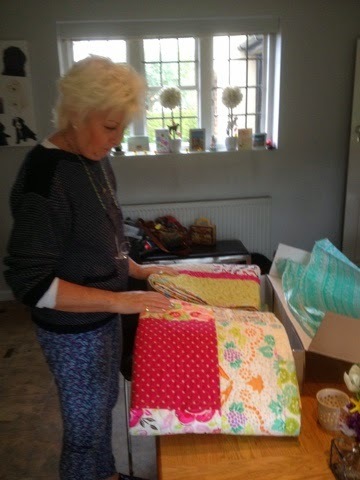 I was up in Surrey just before Easter and delivered the birthday surprise quilt to my friend Helen. 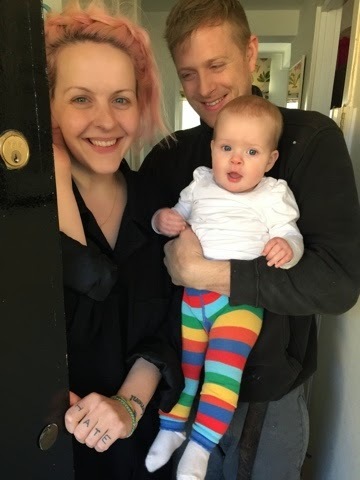 She was so delighted and the bright colours went well in her bedroom. Big Hit! I went to London and saw Dot and Minnie. 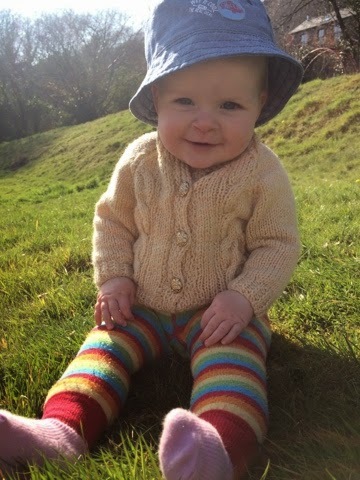 My little granddaughter is growing fast and is totally gorgeous. 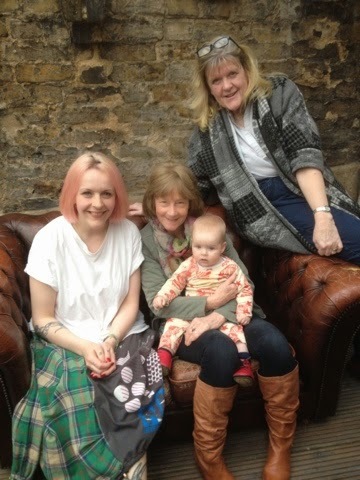 We met up with my cousin Margi whom I haven't seen for a couple of years so lots to catch up on. 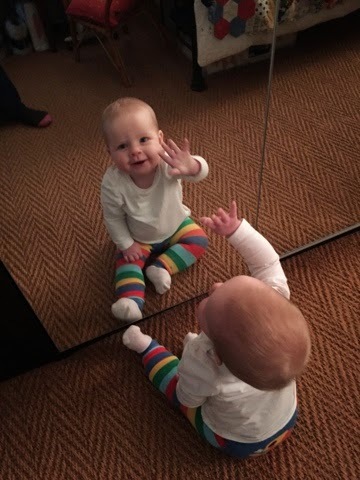 Minnie has discovered the mirror and is so funny when sat in front of it! Robbie's been down for Easter which was great. 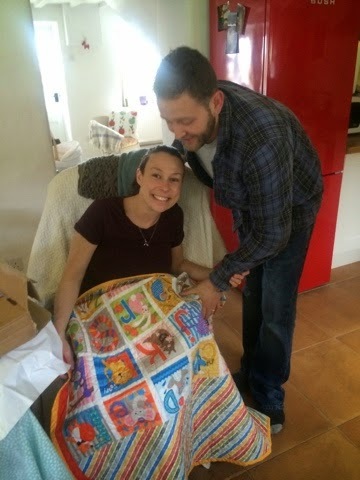 He visited friends who have just had a little girl and delivered another quilt which was a success. and this weekend my sister and brother in law are here so I'm having a mad clean up! Too many cobwebs! I'm really enjoying sewing this knowing what a success it will be! My cross stitch has taken a back seat recently as my hand is still sore from the accident. I can only sew for about an hour before it begins to ache. So annoying. And now I'm off to do some baking ready for the weekend. I hope everyone is keeping well and enjoying the spring sunshine. Thanks for popping by! 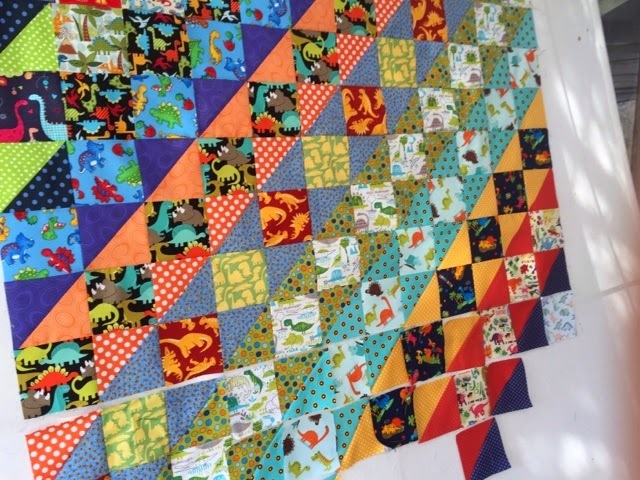 I love your blog posts and the pictures of your quilts. 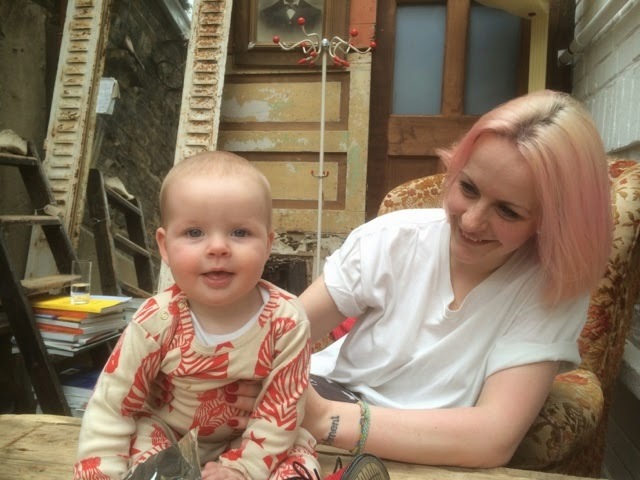 I especially like one of your pictures from when you visited London and saw old sewing machines being used as decoration in a shop at Nottinghill. 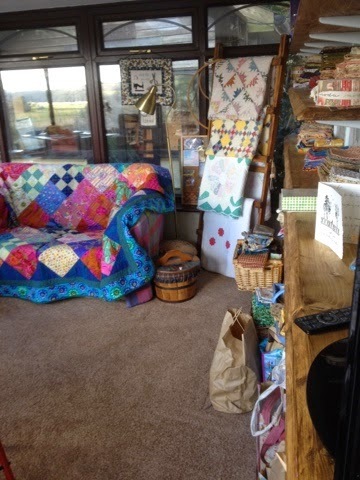 I love quilting, sewing, and old machines. 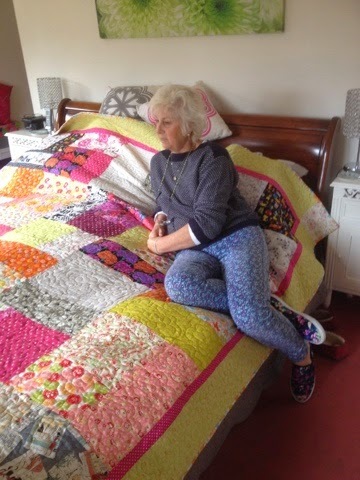 I have a lovely old Singer from the 1940's that my darling mother-in-law bought for me for my birthday and it can sew through all things imaginable - it is sort of in retirement now while I quilt with my Memory craft Janome - but the Singer is beautiful. Like you my child is grown up so I have the luxury of sewing when I like (outside of the four days I work) and share the sewing room with my two dogs and a cat or two. I read of a car accident you had some time ago so I hope that isnt what has prevented you from sharing your thoughts on sewing etc. I personally hope you find the energy to blog more often because i enjoy reading your entries - it is summer here in New Zealand so I have to hide away from getting sun-burnt ... so good blogs, sewing, good books and movies all keep me out of the sun - Im not a big fan of heat and sun. Apart from when the kids are visiting from their hectic London lives, I am never happier than when sat at a sewing machine. 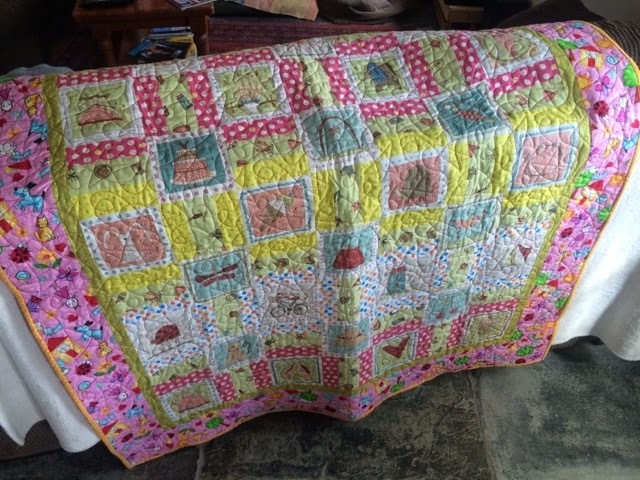 I love making quilts as wedding gifts, 21st's, babies, special birthdays - in fact as long as someone shows enthusiasm for owning something totally unique I am happy to make. A cross-stitch sampler, or a quilt is a gift made with love - and there is nothing more precious than the time it takes. There is so much gorgeous fabric out there for inspiration, and sampler patterns too. No excuse for idle hands! I love living in Devon - I have a wonderful view from my studio across the River Tamar into Cornwall. It is a view that inspires. I travel back to Cobham in Surrey often as I lived there for 20 years and still have many friends whom I love to see. I am truely blessed.